Benyamin Korn, Director of Jewish Americans for Sarah Palin, has written an excellent article about the Shabbaton that his group hosted in Hershey, Pennsylvania on Friday and Saturday (Jewish sabbath). He gives a fascinating account of the event and of meeting Governor Palin. Originally published in the New York Sun. Driving to Lancaster from Philadelphia Friday afternoon, my wife and I passed through a town named Ephrata. In was named after the town that, in ancient times, was part of the city of Bethlehem; today it is a thriving Israeli city of 8,000-plus. Friends and colleagues who were meeting us in Lancaster passed towns named Bethlehem, Nazareth, Lebanon, and Zion. Early Pennsylvanians believed, as many modern ones do, in the Divine promise that the exiled Jews would be returned to the land of Bethlehem and Zion. How appropriate, I thought, to help usher in our Shabbat with Governor Palin, an American political leader who, more closely than many, identifies with the Holy Land, ancient and modern. Independent-minded American Jews, like their Christian counterparts, are justifiably alarmed by these phenomena and are searching for ways to return stability and morality to American family life. It was to in support of this goal that my organization, Jewish Americans for Sarah Palin, set up a Shabbaton — a Sabbath gathering for meals, songs, prayers, and conversation — with the assistance of the Pennsylvania Family Institute, to be a part of their weekend with Mrs. Palin. By evening, the halls of the Hershey Lodge were filled with the aroma of chulent, the traditional Sabbath stew. More than 1,000 citizens came to the $200-a-plate dinner with the governor, including a small group whose members paid $25,000 each to sit at the governor’s table. Our Jews for Sarah tables included a cross-section. Some came from Philadelphia, Baltimore, or North Jersey, while others from farther afield. Dr. Joseph Frager, president of the Jerusalem Reclamation Project, made the drive from Quuens. One participant flew in from London. Jewish Americans for Sarah Palin is not a Jewish religious organization, although many of our members are Orthodox. Most of the Shabbaton participants were Sabbath observers, although some were not. We even had several Christian supporters of Jews for Sarah, including Dr. Celeste Mattia of Philadelphia, and Dr. Richard Bishirjian, of Armenian Christian descent, who is president of Yorktown University in Denver. Meeting Sarah Palin turns out to be not the kind of celebrity thrill one experiences by meeting, say, a member of the Rolling Stones. My wife and I found her unpretentious and gracious both, with an un-politician-like sincerity. She expressed gratitude for the work of Jews for Sarah. We brought a small gift for Mrs. Palin’s family, a video disc of “Praying with Lior,” the film about the bar mitzvah of a Jewish child with Down’s Syndrome. My colleague Sheya Hanstatter, director of PalinTV, presented Mrs. Palin with the ArtScroll edition of Perek Shira, a commentary on the song of celebration sung by Jewish women during the exodus from Egypt. Mrs. Palin received the Hebrew volume with obvious delight; she has used the biblical Book of Esther as bedtime reading material for her eight-year-old daughter, Piper. She wants Piper to emulate Esther, Jewish history’s great heroine, who risked everything to save the Jewish people from Haman’s plan for genocide. On her lapel, she wore a pin showing the American and Israeli flags intertwined. As we enjoyed our Shabbat meal, we listened to Mrs. Palin’s references to “Judeo-Christian values” — a concept well understood by the deeply religious Christian audience with whom we shared the evening, including more than a few Amish ladies wearing their traditional bonnets. Mrs. Palin spoke of how the family is the building block of society and how strong families mean a strong nation. She did not suggest that Democrats do not share the attachment to family. But she warned that the most immediate threat to American families is the administration’s economic policies, which will burden our children’s generation with crushing, inescapable debt. Mrs. Palin’s message is beginning to resonate among American Jews. I see it in the new open mindedness among friends and associates as they get to know Mrs. Palin. I see it in the response among American Jews to the articles and activities and website of Jewish Americans for Sarah Palin. And we can all see it in the new Pew Research Center survey showing 33% of American Jews now support the Republicans, an increase of 13 percentage points that is more than 50% higher than the 20% who identified with the GOP just two years ago. Although 65 years have passed since the Holocaust, the threat of genocide still hangs over the Jewish people — and again from Persia. Iran openly threatens to wipe Israel off the map. Hamas, with its charter calling for the extermination of the Jewish State, fires rockets at Israeli schoolchildren. Syria races to build chemical and biological weapons to use against Israel. Mrs. Palin makes it clear that she recognizes these threats to America’s ally, Israel, and wants to end them. She minced no words in her remarks to the Pennsylvania Family Institute, criticizing the Obama administration for “coddling our enemies while abandoning our treasured ally, Israel.” On her lapel, she wore a pin showing the American and Israeli flags intertwined. But for the most part, our Shabbat with Sarah Palin transcended politics. It was a Salute to the American Family, an occasion for connection between conservative Christians and conservative Jews. It offered a chance to exchange a knowing look with the Hockey Mom from Wasilla, about our beloved special needs kids. And then she was gone, off with her “bodyguard Piper” to speak the next day before 300,000 at the Lincoln Memorial. For us it was a memorable and moving shabbat, full of songs and prayers, hearty food, and our plans and dreams for bringing back home the message of our American Esther. Glenn Beck’s Restoring Honor Rally brought hundreds of thousands of patriots to the Lincoln Memorial on Saturday. It was not a political event; it was an American event. Many say it was more like a “revival” with a clear message that America needs to return to faith, to God, to the honor that is the fabric of our very existence. It certainly had a clear spiritual message–one of dependence on God, unity, and hope. And our troops received the respect and recognition they so deserve. How appropriate the song “Amazing Grace,” for we are what we are by the grace of God, and we are in desperate need of His continued grace to get where we must go. God bless America, and, more importantly, America bless God. In this mailing sent today, GOP candidate Michael Grimm delineates his continued efforts in fighting the proposed mosque to be located two blocks north of the WTC site, the roll-out of a new website and the chance to be featured on that site. Grimm is running for New York’s 13th Congressional District, which covers Staten Island and part of Brooklyn. He is campaigning against Michael Allegretti for the GOP nomination in the September 14th primary. The nominee runs against Congressman McMahon. Governor Palin endorsed Grimm on July 28, 2010. US for Palin Publisher, Ron Devito is campaigning for Grimm walking door-to-door in the 60th Election District. Welcome to this week’s email blast where you can keep track of Michael Grimm’s Congressional Campaign in NY-13. Find out about exciting developments, get updates, and follow the campaign all at once! Human Events, a leading Conservative publication, recognized Michael Grimm as the People’s Candidate in their article “NY-13 Candidate Shakes Up the Establishment.” Read the article here. Michael Grimm makes another appearance on “Fox & Friends” on Fox News calling for the investigation of the funding behind the proposed mosque at Ground Zero. Watch the video here. Michael Grimm stands true to his values and those of the people of Staten Island and Brooklyn at the Ground Zero Mosque Protest. Team Grimm has rolled out a new website! The website includes new photos, new content and many other unique features. Would you like to be a featured contributor on Michael Grimm’s new website? Or maybe you want to tell the people of NY-13 why you support Michael Grimm’s candidacy? Please go to the website and share with Team Grimm why you believe Michael Grimm is really the “People’s Candidate” in NY-13! Mailers have been distributed to the residents of NY-13 outlining Michael Grimm’s concrete plans to turn our district around proving that Michael Grimm is the only candidate in this race with real ideas rather than the pretentious political rhetoric of his opponents. Michael Grimm continues to meet hundreds of district residents by attending their neighborhood block parties and going door to door on Staten Island and Brooklyn. Look out for new and exciting developments this week as we approach the Primary Election, which is only 2 weeks away on Tuesday, September 14th. We thank you so much for your support. Michael Grimm is a Marine Combat Veteran of the Persian Gulf, former FBI undercover agent and a small businessman running for Congress in New York’s 13th District. For more information about his campaign or to donate, please go to www.GrimmforCongress.com. Paid for by Michael Grimm for Congress. Copyright © 2010 Michael Grimm. All rights reserved. Aside from being a principal PalinVersary, August 29 was also 30 years to the day that I completed a transcontinental train trip to Los Angeles with my uncle William E. Thomas. We would spend 10 days there, then return to my home in Flushing, NY. I got to see our beautiful country during that trip on the Lake Shore Limited from the forests of upstate New York; to the cornfields of Ohio; the steel mills of Indiana. Until the mid 1980s, the Lake Shore Limited departed Grand Central. At Chicago, we boarded the Southwest Chief (“Southwest Limited”); I remember very briefly sleeping in Missouri, then waking up in Kansas and seeing the Rockies even though they were four hours away; traveling through the Rockies, then the buttes of New Mexico and red plains of Arizona. When I woke up the morning of the 29th from a few hours sleep, California’s palm trees were out the train window. I still remember that trip to California like it happened yesterday. And from that time forward, my urge was always to go west, just like our ancestors did so long ago. My return to New York fell out on September 11, 1980 – 21 years before Al Qaeda’s atrocrities. 1980 was the year that the disgraceful Carter administration came to its close as Ronald Reagan was elected. Even at the ripe old age of 11, if I could have voted it would have been for Reagan. Twenty eight years later to the day I walked on the streets of Los Angeles as a pre-pubescent child, John McCain gave us Gov. Sarah Palin, whose grandparents lived in North Hollywood, the same town where my uncle and I stayed with his mother. As she revealed in her October 4, 2008 rally speech at Carson City, California, Gov. Palin’s father, Chuck Heath was born in Los Angeles. Chuck Heath’s father was a sports photographer covering boxing and wrestling matches of the era and his mother a school teacher. A few people took issue with the Restoring Honor Rally being held on the same anniversary as Martin Luther King’s “I have a Dream” speech. As it turned out, the connection was Providential and apropos. During the rally, some 250 miles to the northeast, 16 swamp white oaks were planted at the WTC memorial, a living sign of renewal and rebirth, while One WTC is now at the 36th Fl. level. After getting my own PalinVersary article to press and Missy Stewart’s, I walked to nearby Snug Harbor with my wife to a Polish festival. As the music and announcements blared, being the chow hound that I am, I went straight to work on the Kielbasa, Pierogies, and stuffed cabbage, all washed down with a pint of Zywiec beer. During the festival, I saw Adrienne had posted, so I did my post-publication routine via the iPhone. While drinking my pint, I heard the name “Rita Cosby” and a book she was promoting. I paid little mind at first, as the announcement was at a low volume. But I heard some key words. “Hero.” Some more noise. “McCain.” My interest piqued. I walked to the table. 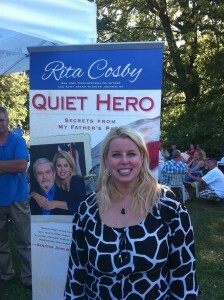 Quiet Hero is about Rita Cosby’s father who fought the National Socialist Worker’s Party of Germany (most commonly known as “Nazis”) and was held as a POW. He kept his story bottled up inside him. Rita – a journalist – got him to tell his story. Senator McCain – the man who brought Gov. Palin to the world stage just two years earlier – had endorsed Rita’s book. So did Dr. Henry Kissinger, who Gov. Palin met with in her 2008 New York City trip. 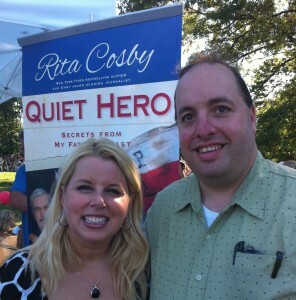 Rita signed and personalized my copy of Quiet Hero. Are all these juxtapositions coincidental? Like Gov. Palin, I don’t believe in coincidences. Things happen for a reason. Going West. Ronald Reagan. Sarah Palin. Heroes. Dreams. Resurrection and rebirth. And on the celebration of a PalinVersary – more heroes and more – Providential Connections. About 1100 to 1200 people turned out for Governor Palin’s address at the Pennsylvania Family Institute’s annual fundraising banquet on Friday night. Her message about family and patriotism was well-received by an enthusiastic audience. After a rousing standing ovation, Palin began her speech with a salute to veterans — asking anyone who had ever served in the military to stand for recognition — a move she readily does on the speaking circuit. She spoke frankly and openly about her trepidation at learning while 12-weeks pregnant with her youngest child, Trig, that he would be born with Down syndrome. The former Alaska governor gave the hosting town of Hershey a nod, quipping that last summer, while filming the upcoming Discovery channel documentary on that state, she largely lived on Hershey chocolate (campfire smores to be exact) and gained 10 pounds. She said that shortly after arriving in Hershey on Friday morning, she took a 90-minute run through the bike trails. “I thank Hershey a lot for what you did last summer,” Palin quipped. She said she and Todd agreed to participate in the documentary as a way to combat “the garbage” on television with wholesome, family-oriented programming. She alluded to having a normal American family, filled with ups and downs, the only difference that her ups and downs can be read at the grocery check-out. Former Alaska Gov. Sarah Palin urged conservatives to continue fighting for a “culture of life, a pro-family agenda that will strengthen our country” and a drastically limited government in Washington. “We need to demand that Washington start putting our kids first and stop racking up the debt and mortgaging our futures,” Palin told a sold-out crowd of some 1,100 people Friday night at Pennsylvania Family Institute’s annual fundraiser at the Hershey Lodge. “The country that governs the least governs best,” Palin said. “You’re not afraid to cling to your guns and religions and your Constitution,” Palin said, referring derisively to Barack Obama’s controversial remarks about conservative voters here on the campaign trail two years ago. Palin also took several shots at reporters and bloggers who have written about her family’s travails in recent months. The Pennsylvania Family Institute, led by Elizabethtown resident Michael Geer, describes itself as a nonpartisan research and education organization that analyzes public policies and cultural trends for their impact on families. The banquet and a VIP reception with Palin were closed to the media. 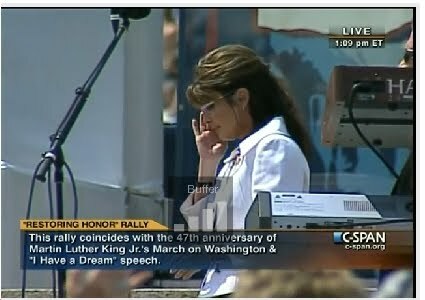 Reporters were permitted to cover only Palin’s speech. She did not make herself available to reporters before or after the event, though she did respond to a few questions that had been submitted beforehand dealing with who her role models were and how attendees could pray for her. Palin was personable and made jokes during her speech but became serious when describing her discovery, when she was 12 weeks pregnant, that her son, Trig, would be born with Down syndrome. “All through that pregnancy I was wondering, ‘How in the world am I going to handle this?’ ” she said. Palin went on to describe how she managed to keep the pregnancy a secret from the public for seven months at a time when she was the new governor of Alaska. She said that because the winters are so cold there, she was able to conceal her pregnancy by piling on heavy coats and scarves — drawing laughter from the audience. 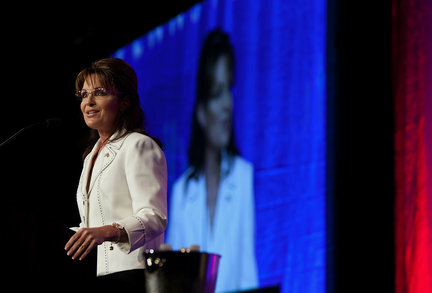 Palin also encouraged attendees to fight for a more public role for religion. Sarah Palin spoke for about 30 minutes in Hershey before doing a question and answer session on stage. She didn’t focus on politics, instead she captivated the audience with a pro-family themed speech using examples from her own family. Her message was strong and clear; more Americans need to focus on traditional family values. Sarah Palin calling on those in attendance at the PA Family Institute banquet in Hershey, Pennsylvania to lead the charge. “She’s a great spokesperson for the values that PA Family Institute stands up for, and we’re thrilled and honored to have her come in,” says Kent Martin of Elizabethtown. The former vice-presidential candidate talking about abortion, marriage and overall putting trust in God to do the right thing. “What else do we have at the end of the day? I know I have nothing put my faith in God, ” says Palin.